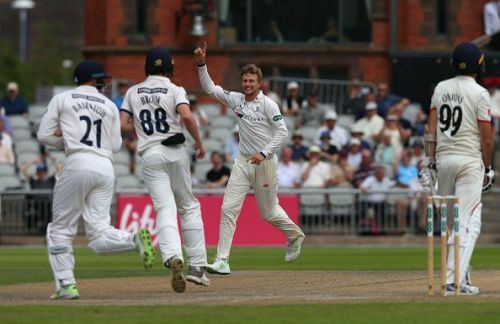 London, Jul 24 (AFP) England captain Joe Root starred with the ball rather than the bat as his career-best figures helped Yorkshire defeat arch-rivals Lancashire by 118 runs at Old Trafford today. Root, one of the world's leading batsmen, took three of the four wickets to fall before lunch on the third morning with his occasional off-spin. This victory eased White Rose Yorkshire's fears of relegation from the First Division of the County Championship. Root, one of several England players involved in this fixture, had been hoping to spend time in the middle getting valuable red-ball batting practice ahead of next week's first Test against India. But in Yorkshire's first innings he made 22 before he was the first member of a star-studded hat-trick from Lancashire all-rounder Jordan Clark that also included New Zealand's Kane Williamson and England's Jonny Bairstow. Root's second innings was even briefer but he at least had the consolation of being caught behind off England spearhead James Anderson for three. But Root's spin-bowling has proved effective even at international level on occasion and it was certainly too much for a Lancashire lower-order after the hosts resumed Tuesday staring defeat in the face at 194 for six chasing a target of 323. Root, having dismissed England batsman Jos Buttler in the penultimate over of Monday's second day, struck with the first ball of day three when Graham Onions edged behind for a duck. Lancashire captain Liam Livingstone, who fractured his thumb on the first day and did not bat in the first innings, came out to bat at No 11 on Tuesday in a desperate effort to salvage a draw. But he was left not out without facing a ball as Lancashire lost their last four wickets for 10 runs, with Livingstone now set for a lengthy lay-off.